The very popular lean to conservatory is also sometimes known, or referred to, as a Mediterranean conservatory. The simplicity of the basic design shape makes it appealing to a large number of home owners, making it one of the most common conservatory design in the UK. Not only does the lean-to conservatory style offer a lot in terms of a simple elegance, but also has a modern appeal that suits most of todays’ contemporary home designs. For those considering having a lean-to conservatory built, here is an easy to follow summary of some of its features, styles as well as the costs to be expected when installing this type of conservatory. 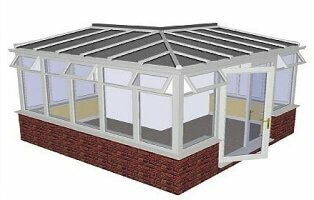 What are the main features of a lean to conservatory? This type of conservatory can be built using uPVC, wood or aluminium. Whilst wood gives the design a more conventional look, it can “weather” faster than uPVC or aluminium if it is not looked after and maintained regularly. Aluminium is the most durable but can also be on the expensive side. uPVC, as a competitively priced material, is therefore commonly used, not only because it is affordable but also very durable. This style boasts a low pitched roof design making it a great choice for all home types including bungalows. For people interested in more natural light and visual appeal, full glass double glazed roofing can be used. These modern double glazed roof panels come with the added advantages of being easy to maintain (especially with the advent of self-cleaning glass) and effective heat / energy management properties. 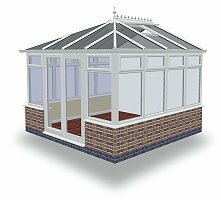 If you prefer, lean to conservatories can be fitted with a tiled roof, either as a replacement or when newly built. The solid roof option has the benefits of stopping all glare from sunlight and can keep the room at a more stable or constant temperature throughout the seasons. For those who need to work on a tighter budget, polycarbonate roofs can be a less costly alternative to double glazed or tiled roofing for a conservatory. Apart from the cost advantage, poly-carbonate roofing can protect from harmful UV rays and has a few colour options. Twin, triple or multi-chamber profiles of over 25mm (up to 35mm) thickness are recommended. Tinted glass to cut down glare. Integrated roof or window blinds to regulate temperature and privacy. Thermal solar control roof glass for preventing heat build-up. Double glazed side walls, with low-e glass (up to 24mm thick). Roofing vents to help regulate temperature and provide air flow. If the new conservatory takes up space greater than half of the property’s yard or if it is situated in front of the house. The property where the conservatory is to be built is on a designated area such as a National park, an area of outstanding natural beauty or a conservation area. What are the benefits of building a lean-to conservatory? Variety of uses – This conservatory type can be put to many a use. From additional kitchen space to a leisure sunroom, there is no limitation to which use this conservatory can be put to. What’s more, the design provides ample space for whatever use you need. Low on costs – This is an affordable conservatory design that allows one to spend less whilst maximizing on one’s existing space. High value investment – This conservatory design escalates the value of the home making it more attractive to buyers. How much does a full glass lean-to conservatory cost? This is a lean-to glass conservatory design that uses glass from wall to ceiling. A standard one will cost approximately £6,000 to £8,000. 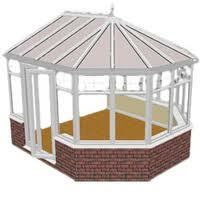 At this price the conservatory is likely to be of white uPVC, with double glazing, a set of doors and dimensions of up to 2500 mm wide x 2500mm deep. How much does a Dwarf wall lean-to conservatory cost? This design incorporates brickwork at the bottom and glass at the top. A standard one will cost an approximate of £6,500 to £8,500. This price is likely to include polycarbonate roofing of 25mm, windows and doors framed with uPVC and all the groundwork & brickwork dwarf walling. These prices are just to give a general idea of the market and differ with the customisation required to meet the specifications set by each buyer. Prices can increase or decrease with the roof types, colours, doors and windows, permits needed, glazing types, size and finishing of the conservatory.